Three-dimensional shapes fill physical space in a certain way. If you pour marbles into a jar, the marbles will randomly pack within the jar. If you carefully placed every marble, layer-by-layer in the jar such that the marbles in one layer sit within the crevices between marbles on the layer below it, you can pack a few more marbles in the jar than if it was randomly packed. This will give you the highest density packing, or the least amount of space between particles. Linus Pauling applied this idea of packing density to ions, and proposed that packing principles lead to the formation of crystal structures. Nature does not like empty space, so particles should pack in the highest density or close-packed formation. In the field of materials science, colloid crystals and nanoparticle superlattices form via self-assembly of small particles in which the particles form a thermodynamically stable structure. The structures nanoparticles form are very often those found in conventional metals: face-centered cubic, simple cubic, and body-centered cubic. 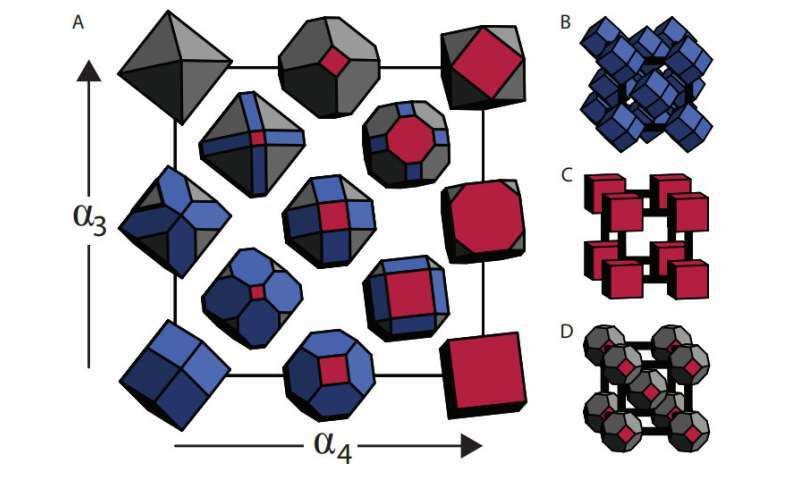 The theory is that packing principles guide the self-assembly of colloidal crystals. However, researchers from the University of Michigan have shown that the ordering mechanism for colloid crystals does not cause particles to self-assemble. Instead crystal assembly and packing are correlated, not causal. Furthermore, they show that packing principles may not be the best prediction tool for colloidal crystal shape. Their work appears in The Proceedings of the National Academy of Sciences. In self-assembly, a thermodynamically stable structure is formed. This structure minimizes free energy. For colloids, this frequently happens when entropy is at a maximum. However, when studying the mechanisms that guide self-assembly, researchers look at what happens at extreme conditions. At very high pressures, rather than maximizing entropy, hard particles will maximize density. To investigate the fundamental question of whether packing principles guide self-assembly, Cersonsky, et al. used modeling methods to compare three different density terms. The first is the self-assembly density, which is the lowest density where self-assembly is observed. The second is packing onset density. As the name implies, this is the lowest density where packing behavior is observed. The third term is the random close packing density, which is the maximum density that the system can be found in a disordered state. When looking at mathematical models at very high pressures (i.e., infinite pressure), there should be a boundary at which particles being to pack. The authors tested for this boundary using Maxwell relationships to define packing onset density. If the self-assembly density is found to be approximately equal to the packing onset density, then packing is likely guiding self-assembly. However, if the self-assembly density is less than the packing density, then something other than packing rules guides self-assembly. Furthermore, packing density is compared to the random close-packing density. Cersonsky et al. found that in all of polyhedral systems that they studied (FCC, SC, and BCC) the packing density was greater than the random close-packing density, which was greater than the minimal density for self-assembly. This result shows that spontaneous order does not occur because of a packing mechanism and that these systems cannot be ordered by packing. In other words, packing rules are not necessarily predictive of the ideal shapes for self-assembly even though the dense packing structure is the most thermodynamically stable structure. This paper looked at nanoparticles that were not confined. According to Greg van Anders, assistant professor of physics and co-author of the paper, "We expected that we would find that colloids would order by packing. Instead, we found that they don't. This is particularly surprising because particles don't pack even when the structures they form are so-called 'close-packed' structures." Usually in materials science, packing rules are used to predict the optimal shape for a nanostructure, but given these results, the question becomes if, and when, packing rules can be used to predict the thermodynamically optimal shape for self-assembly. "After we found that the mechanism that drives the formation of structure is not packing, we realized that this might mean that perfectly-shaped particles, which pack most densely, but can be technically challenging and expensive to make, might not be the ideal shape for target structures."